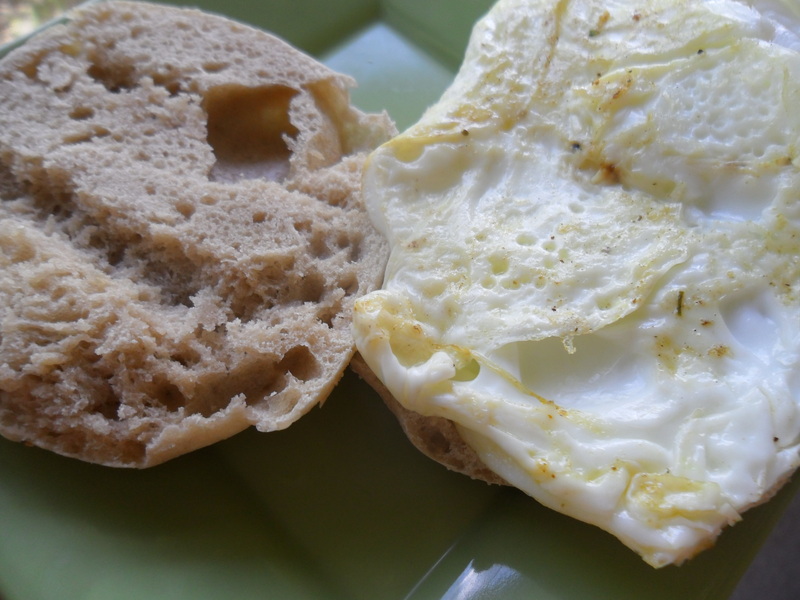 An egg should not be a “patty,” a hockey puck, or in any other unidentified form. Good cheese doesn’t have to be pumped with antibiotic-laden dairy. Bread should be made with whole grains and wholly nourishing, not white, sugary, and processed. And nothing should be fried in hydrogenated oils, ever. 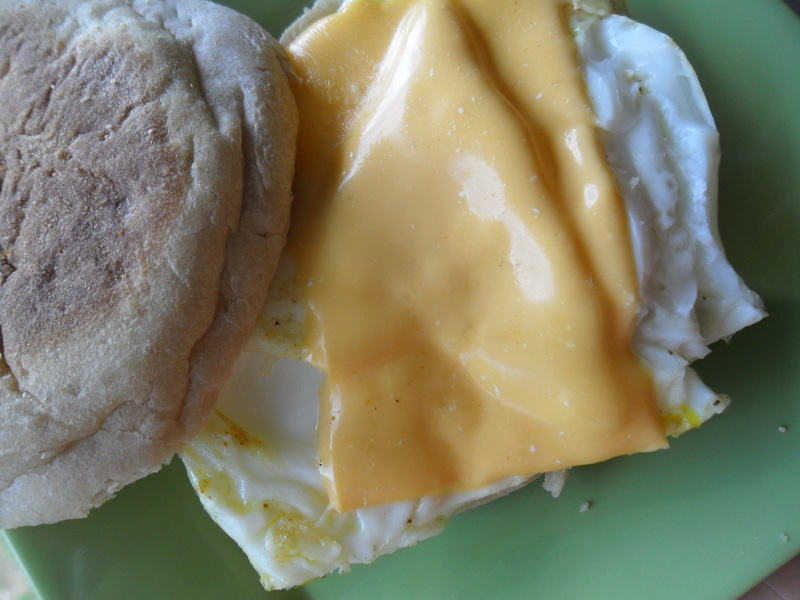 But McDonald’s classic Egg McMuffin sandwich goes against all of this. We know this. So why do people still want to eat them? I know for sure there are a lot of reasons why people still order these sandwiches. Lack of knowledge, will power, and delay gratification are just a few. -Pull out your two eggs. Get ’em ready. If you’re using the whole egg, you’ll probably have quite a bit left over. If you’re going egg whites only like I did, you’ll be right at a good amount. -In a small skillet, turn the heat up to medium. It should get hot rather quickly. And when you can drop a few droplets of water on the skillet and watch them sizzle, then spritz with a good deal of cooking spray and crack the eggs over. Cook for about 2 minutes until the outer edges firm up, and then turn the pan a bit, letting the runny egg that remains cook to the outsides. When a fairly thick bottom has formed, you’ll be ready to flip. If you wait too long, it’ll stick to the bottom of the pan. -Meanwhile, get the muffin ready by toasting it lightly. 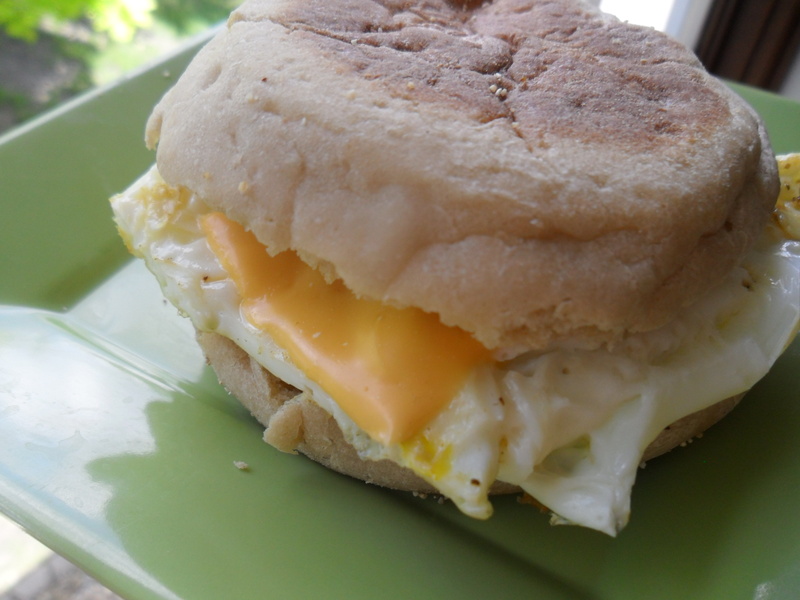 -When the egg is cooked all the way through, remove and fold gently to fit to the size of the muffin. Lay cheese over the top and watch it melt. Easy, right? Like 10 minutes or less easy. You can’t be that. 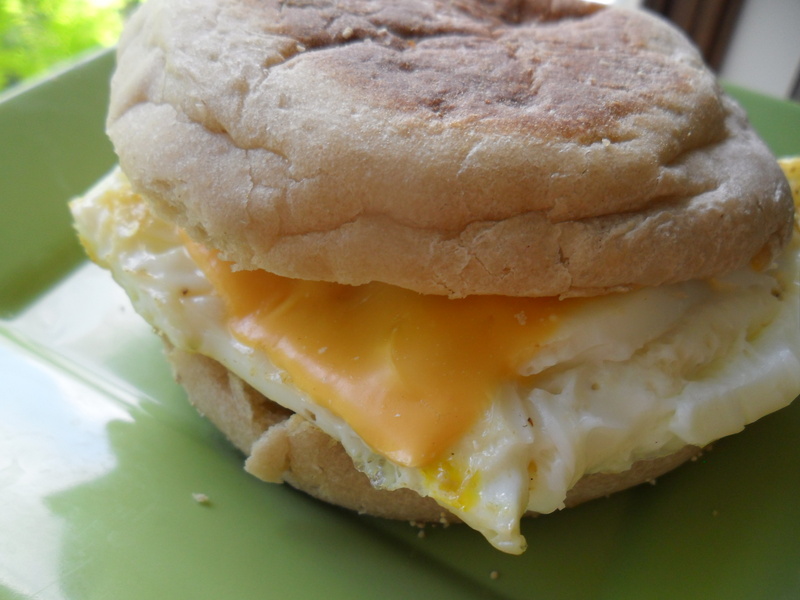 It’s cheaper than a McMuffin, and a lot better for you, too! You won’t feel yucky and bloated afterward, and if your arteries could talk they’d probably say thanks, just sayin’. I’ve heard it called an “Idaho Sunrise” by a fellow foodie blogger, Our Best Bites. While I’ve never been to Idaho, I’ve heard the land is beautiful, so I’ll fallaciously correlate that with equally beautiful sunrises and equally wholesome breakfasts. Hey, you’ve got to have a good breakfast, especially if you’re living/ working in Idaho’s rugged terrain. First, use a smaller egg for stuffing or scrape out more of the insides. I used a large egg and it overflowed, making things a bit messy. Second, season well and consider sprinkling with cheese, salsa, chives, or whatever other toppings you like. Third, serve warm and allow ample time for the egg to cook all the way through. For a quicker cook, microwave the potato to soften, then stuff with egg and broil on high, checking frequently. Otherwise, preparing is pretty simple. Preheat oven to 400 degrees. Lightly grease a cookie sheet or ramekin. Set aside. Slice a thin, but not too thin, layer of skin off one side of the potato. 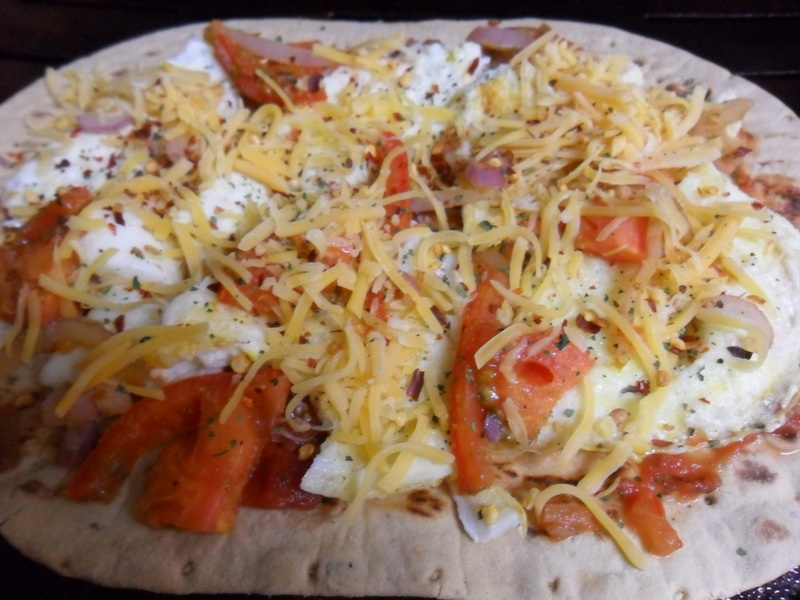 Carve out a hole and fill with egg (or stuff with additional toppings on the inside). Do not add toppings to the outside yet because they’ll cook too quickly. Bake for 30-35 minutes or until potato is tender and egg is cooked all the way through. If you add toppings, you can do so now and bake an additional 3-5 minutes. Or you can broil for a crispier finish. 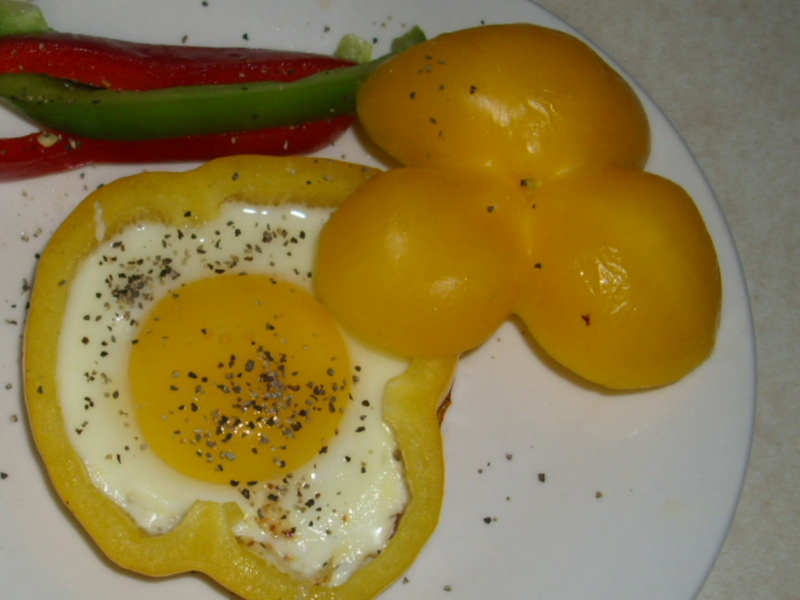 Want a breakfast that’s as bright as you are in the morning? Okay, maybe you’re not as alert and enthusiastic as I am in the mornings–which I think frightened the poor students in my 8 a.m. and 9 a.m. sections of English 250–but your morning could be a lot brighter with this very simple tortilla bowl recipe. -Preheat oven to 400 degrees. Lightly grease a muffin tin. Set aside. -Heat a small frying pan to medium heat for a few minutes. Prepare eggs and milk and spices in a small bowl, mixing well. Once pan is hot, coat with a little cooking spray and begin scrambling eggs. 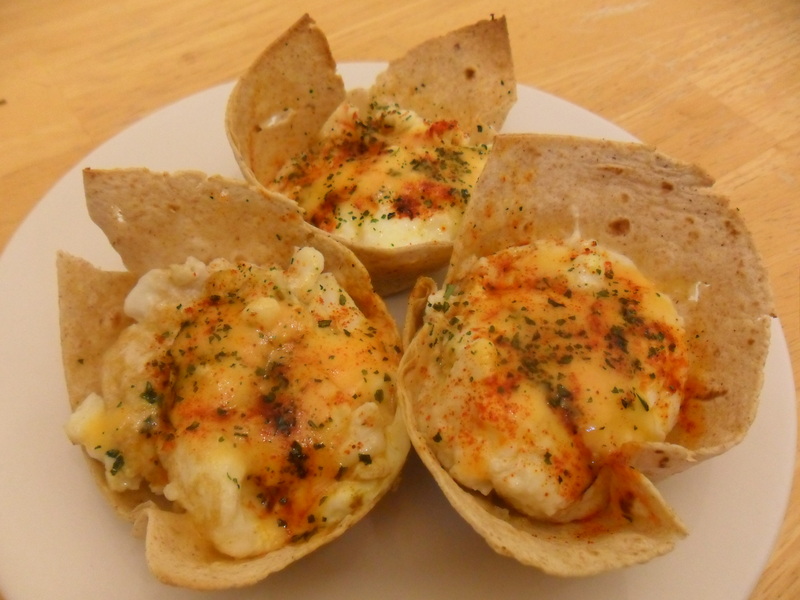 -Meanwhile, make the tortilla bowls by cutting the tortilla into three evenly sized triangles. I used a pizza cutter for smooth edges. Press into muffin tin, folding as necessary to fit. 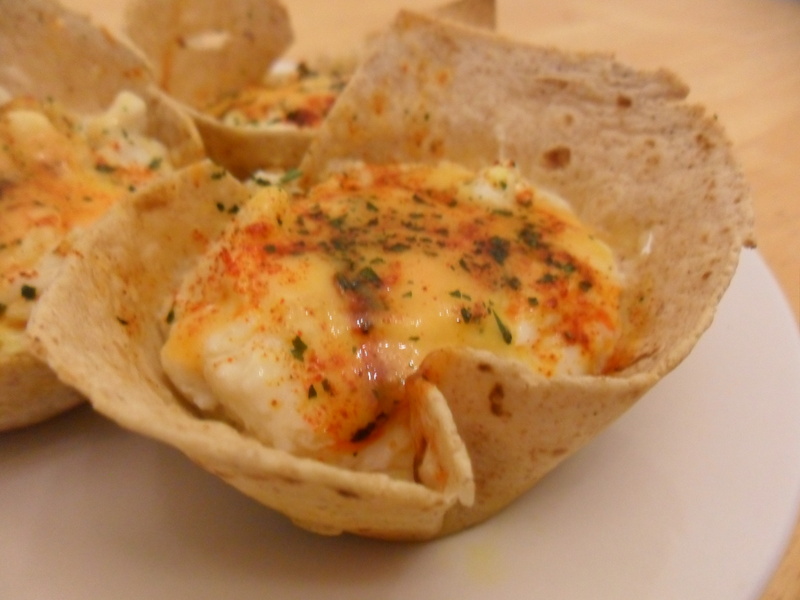 -Once eggs are nearly finished, start transferring to tortilla bowls. Distribute scrambled eggs evenly, and top with cheese and salsa, if you like. I also sprinkled the dried cilantro and paprika on top for a little color. 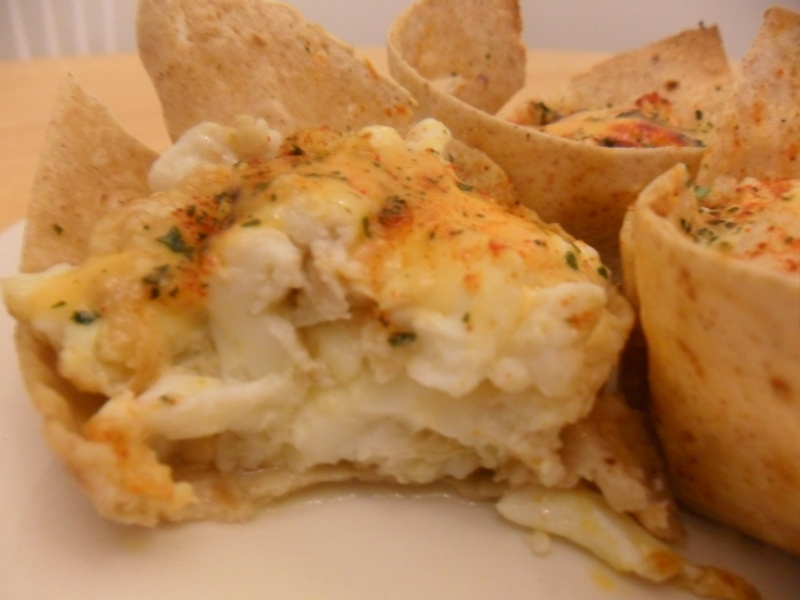 -Bake for 6-8 minutes or until the cheese has melted and the tortilla edges have started to crisp. Let stand and cool a few minutes before serving. Serve warm. You know I love creative meals. 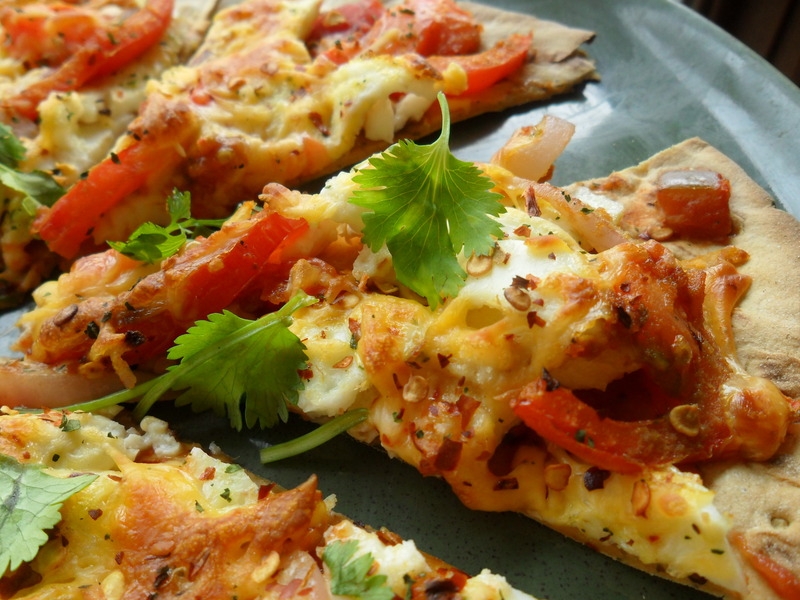 Here’s another fun meal idea: Breakfast Egg Pizza! It started as a wrap, but what gets me about breakfast wraps and burritos is that they’re gone in what feels like seconds. Yes, I realize most people need a few minutes to finish a wrap; I do, too. But you can’t help but always want more. I like to savor food, all its flavors, to really experience it. I’ve heard some call this mindful eating, and I love that idea. 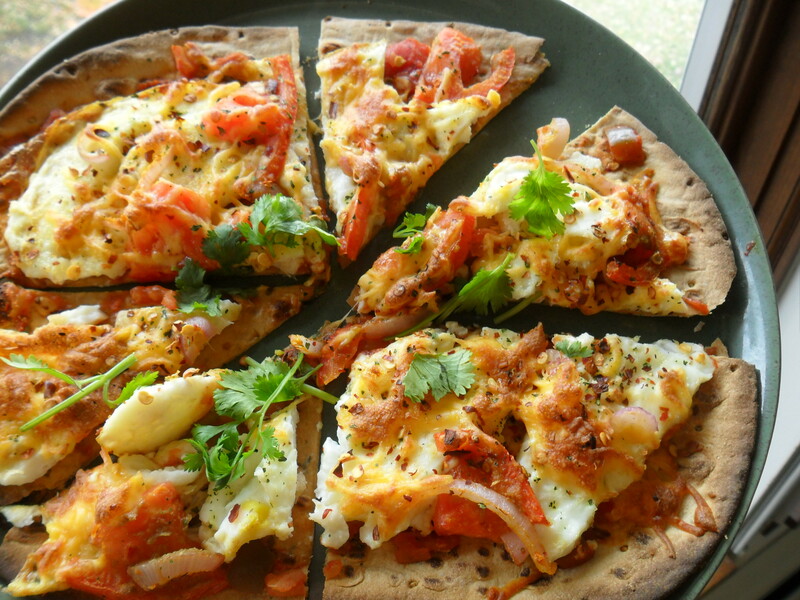 And I love this egg ‘za, too. It seems bigger in appearance, and it’s quite a spread. A nice big meal with lots of complimentary ingredients, all layed out and toasted to perfection. And by cutting it into slices, you have to stop and enjoy each slice all the more. -Preheat broilers to high. Lightly grease a cookie sheet and place wrap flat on sheet. Spread salsa thinly over the wrap. Set aside. -Prepare scrambled eggs as you normally would. When nice and fluffy, transfer to wrap, spreading out evenly. -Add veggies, and then cheese. Broil for about 3-5 minutes or until cheese is bubbly and edges are crisped. -Garnish as you like and serve warm. The pumpkin goodness just doesn’t get old with me. 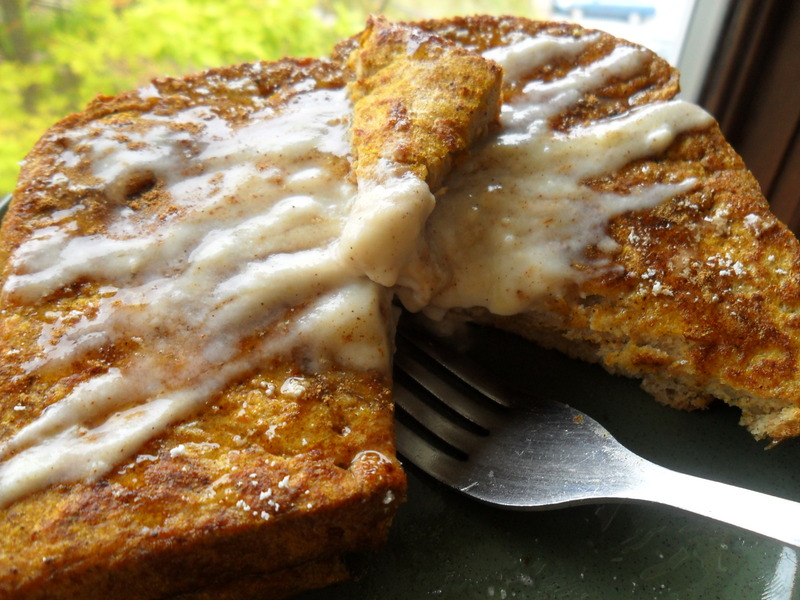 Here’s another tasty treat to warm up your Saturday morning, complete with honey-vanilla yogurt topping and plenty of cinnamon sweetness. 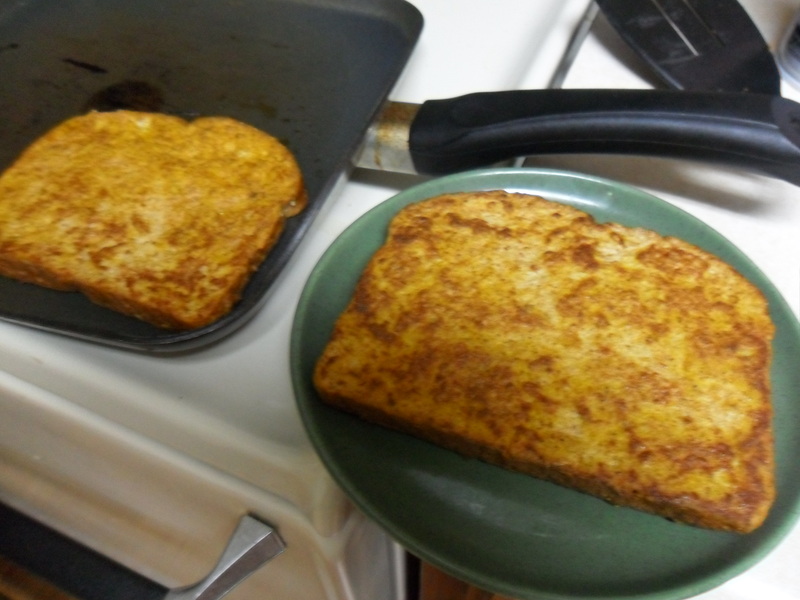 -Toast your bread in a toaster oven if you like. This is optional, but I think it keeps the bread from getting too soggy. 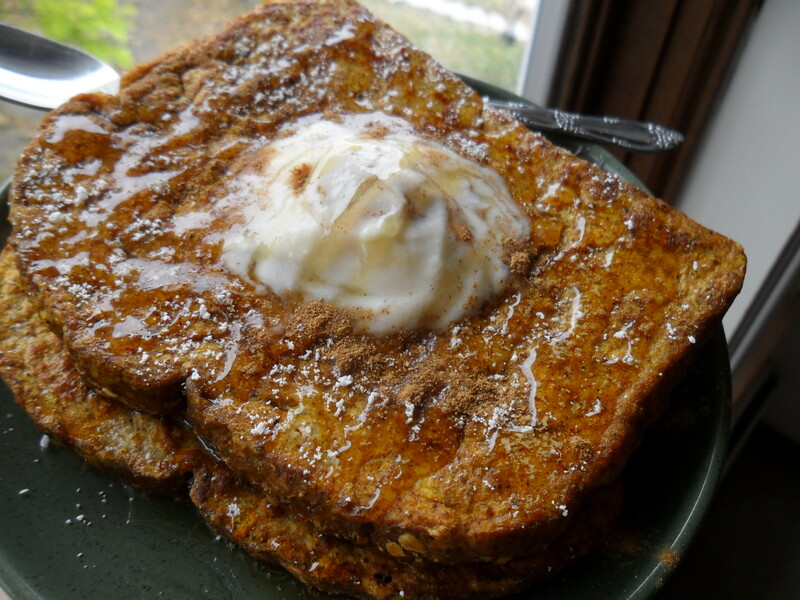 -In a small bowl, combine egg, pumpkin, spice, and milk. Mix well. 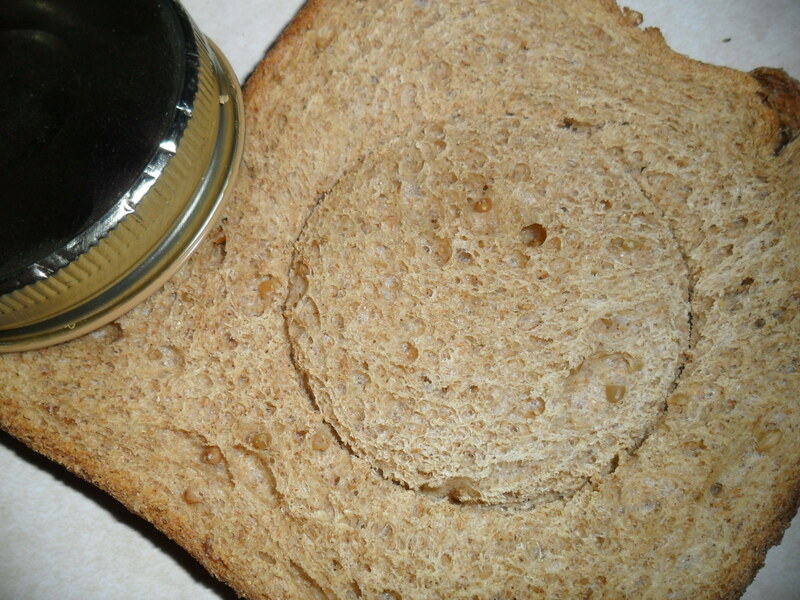 -Dip each side of your bread slices in the mix. Coat well and quickly place on warm, greased skillet. Fry on each side for about 3-4 minutes, or until golden brown. -Top with yogurt, honey, spices, or nuts if you like those. Enjoy warm! 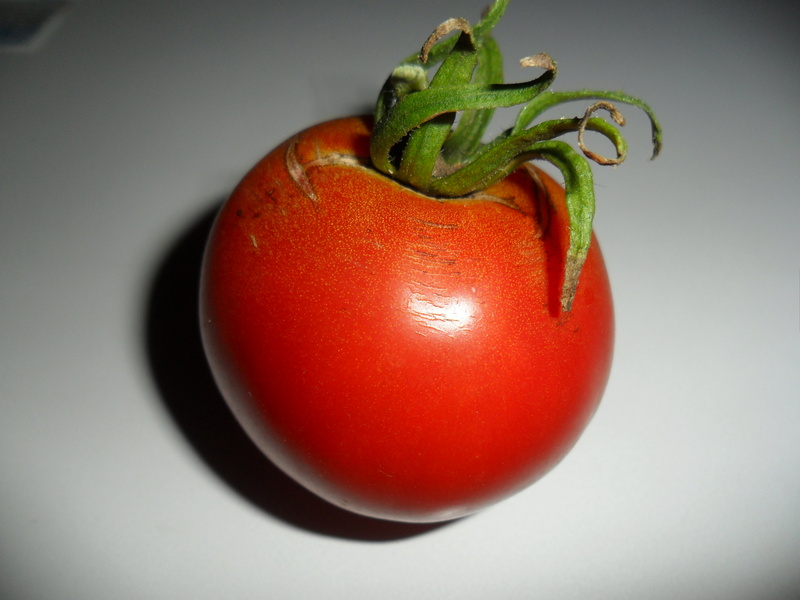 Late last summer I was bored with my regular breakfast routine (whole-grain cereals mixed with peanut butter, cinnamon, banana slices, and almond milk), so I decided to experiment on a very small, runt-like tomato from my grandfather’s garden. 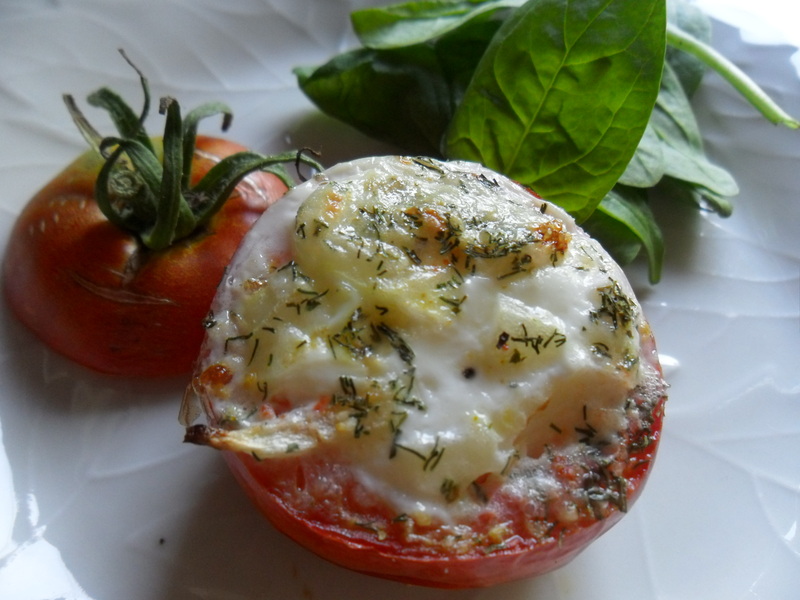 In this tomato, I tested an egg cup recipe I’d seen popping up on Pinterest. It turned out pretty good. The combination of garlic, dill, and Parmesan mixed up my tired old breakfast routine, and it was fun to bake an egg in a “tomato cup” instead of frying in a pan or microwaving in a mug. Listed below is the very small recipe I experimented with, but simply double or triple the ingredient amounts for more tomato cups, which, by the way, I think would make an interesting conversation-starter side dish to any brunch party. A little tomato for a little experiment. -Preheat oven to 375 degrees. Lightly grease a pan. Set aside. 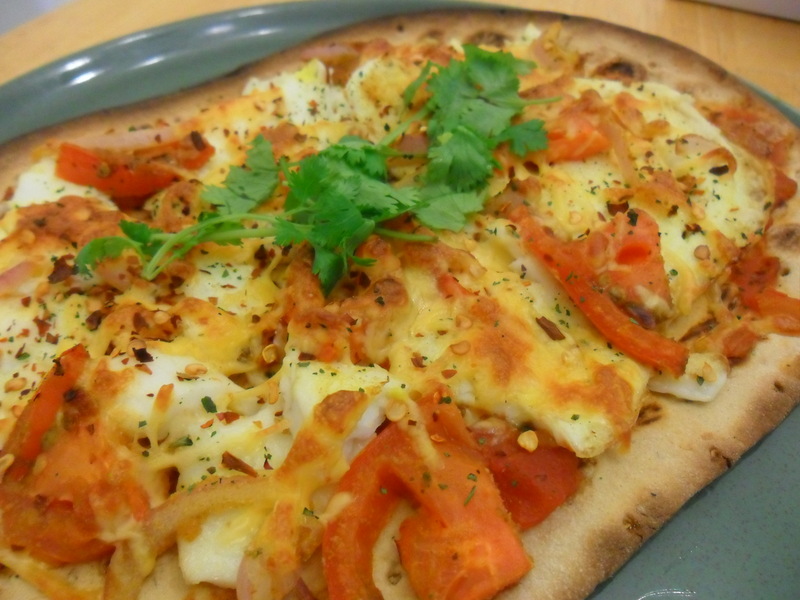 -Approaching the carving process like you might a pumpkin, slice off the top part of the tomato. Set aside. If you have a melon baller, I recommend using that to carve out the pulp, but a small sharp knife will work just as well. Be careful not to poke through the walls of the tomato or else the egg mixture may seep out. -Once you’ve carved out a sizeable hole, drain any excess juice by setting the tomato upside down. -In a small bowl, mix all remaining ingredients ’til well-blended. Pour the egg mixture in the drained tomato. Place on greased sheet, leaving some room at the top because the egg mixture will expand while it cooks in the oven. -Bake for 30-35 minutes or until egg mixture is no longer transparent. 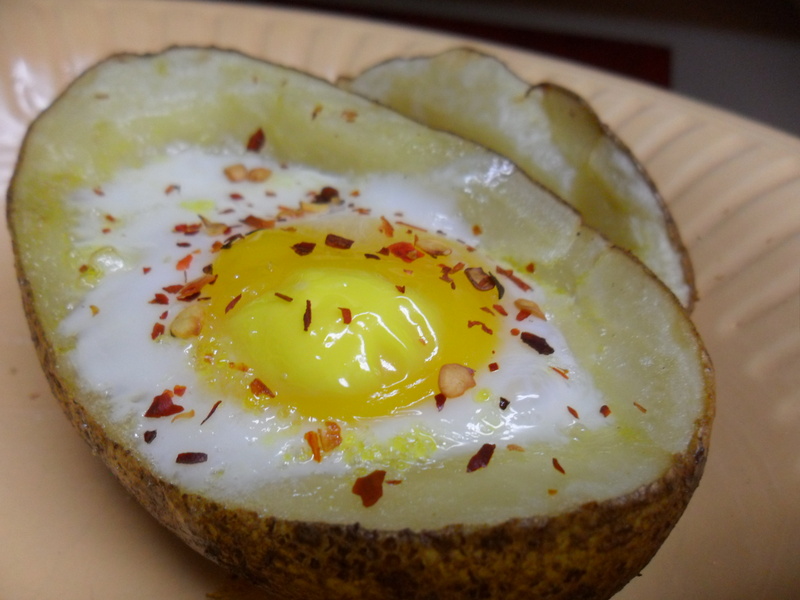 For a crispier egg cup, I broiled mine for a few minutes. Very tasty. Two or three things I know for sure, and one of them is that the Disney family recipe site is where I find some of the best recipes. My mini pumpkin tarts, for example, are always in popular demand around the holidays. And what seems like a nuanced recipe is actually foolproof. The same is true for this recipe: bird in the nest. 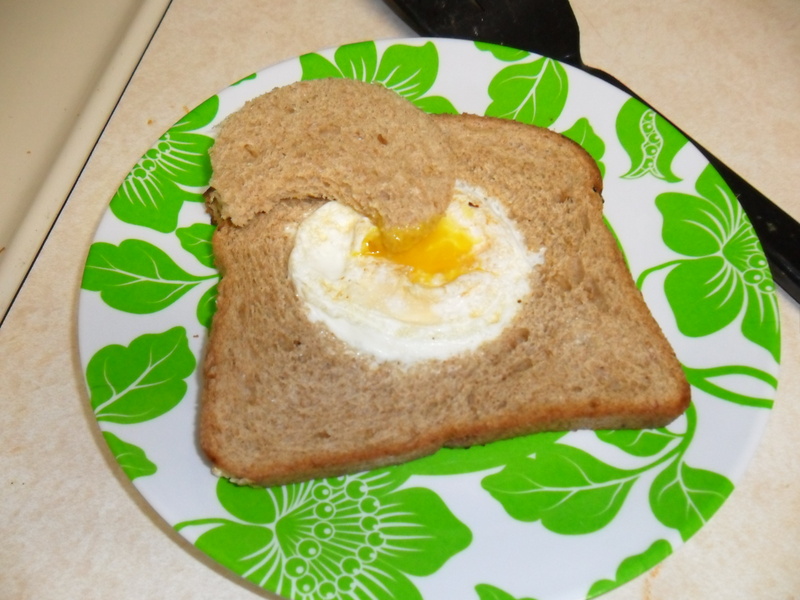 It’s toast and a fun little egg surprise in the middle. I’ve heard others call it “toad in the hole,” but that name sounds awful. No one wants to think of toads for breakfast, and being the English student that I am, an association between eggs and feathered fowl just seems to fit better. Anyway, Disney helped me find this recipe and they’re example uses an adorable flower shape. -Meanwhile cut a hole into the bread slice. I used the lid of a mason jar to cut mine, but a fun cookie cutter would do the job just as well. Or even better, perhaps, if the cookie cutter were bird shaped, egg shaped, flower shaped, or even nest shaped–wouldn’t that be something? -Before adding in the bread, lightly grease the frying pan with cooking spray. Then drop in the bread. 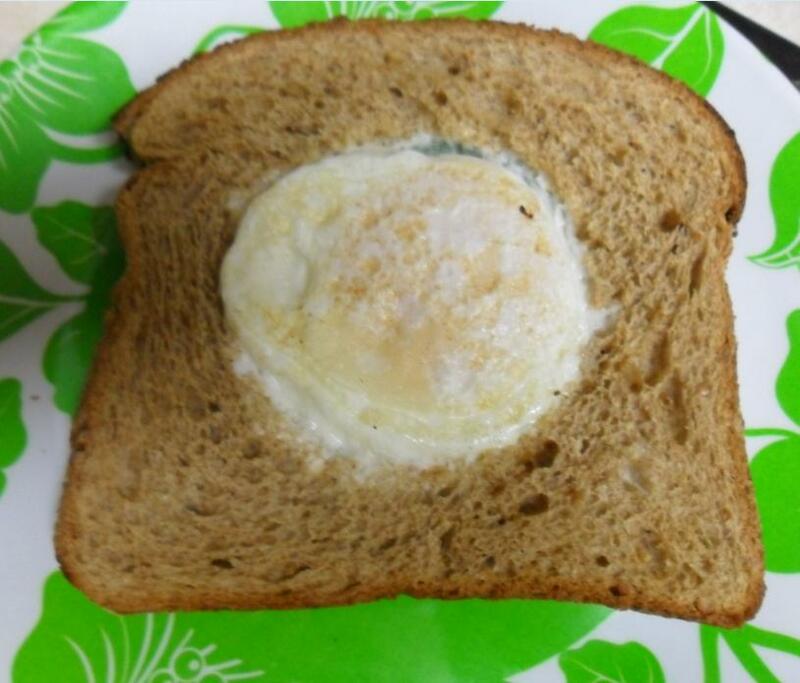 Crack the egg over the hole in the bread and let fry until almost completely cooked. For nest egg over easy, you can flip the almost finished egg for just a few seconds on the other side. 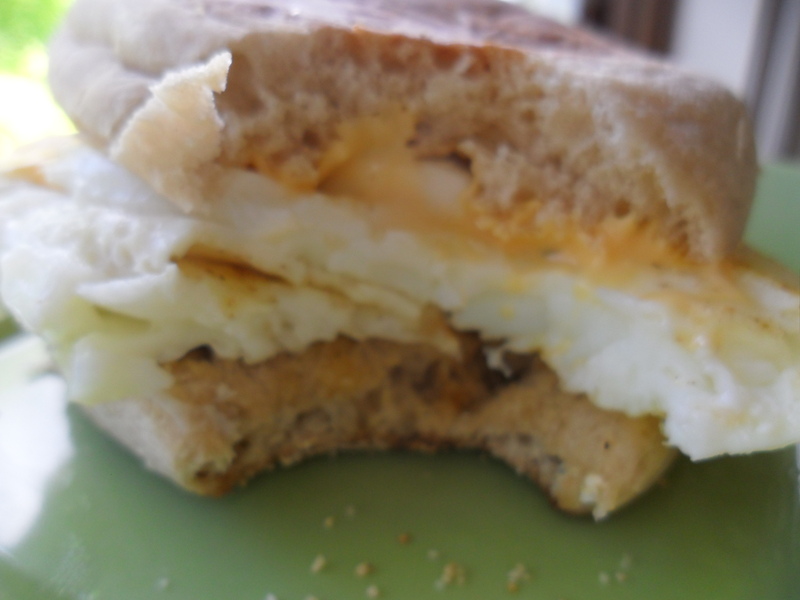 Note: You may need to softly press the bread down around the hole’s edges for a few seconds to keep the egg white from spreading too far outside the hole. 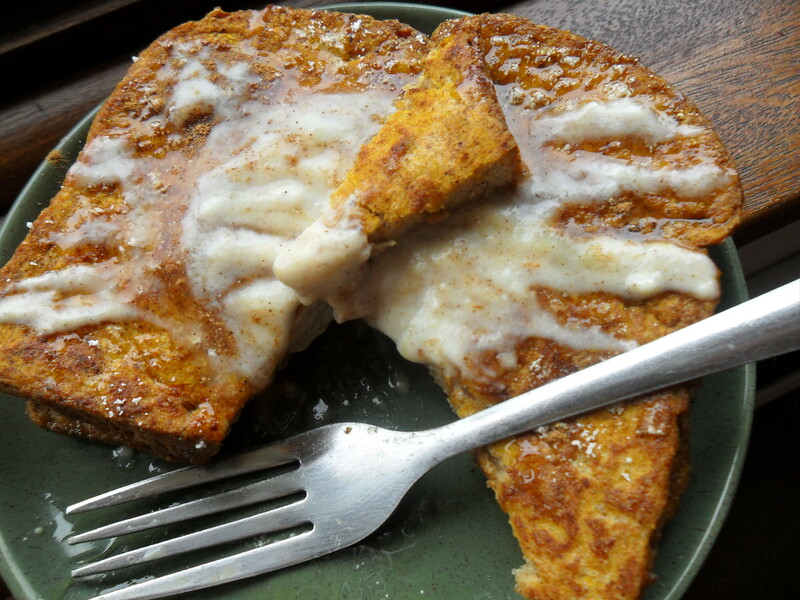 Serve up this warm and toasty creation with whatever seasonings you like. I used the circle from the hole to dip in my runny egg yolks. Yum! Why can’t breakfast be cute? Anti-creative curmudgeons may roll their eyes, but chefs and researchers alike confirm that the aesthetic presentation of food matters. So after a long Saturday morning run, I decided my usual source of protein needed a visual pick-me-up. 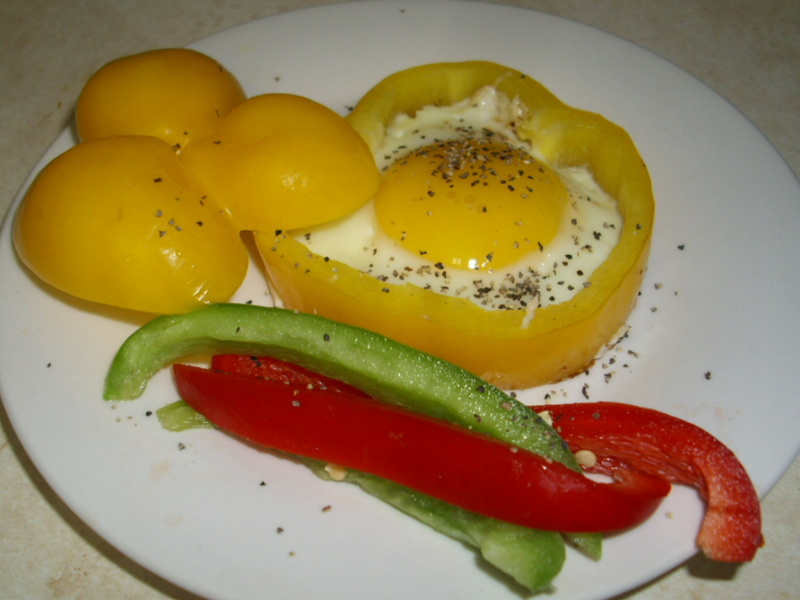 I can’t take responsibility for this easy egg recipe that some, such as Apron Strings, have dubbed “Flower-Power Eggs,” but I can say that it was very fun to make–the fact that I adore bell peppers of every color doesn’t hurt. -Set burner to medium to medium-low, depending on how hot yours gets. Let warm. -Spray the warm pan with a light layer of cooking oil. Place pepper ring in the pan, and then crack the egg and drop into the pepper.You may need to hold the pepper down a bit to ensure that the egg doesn’t creep out underneath. My burner is a bit uneven, so this was a problem. If yours starts to escape, press pepper ring down gently to stop the flow of liquids. Once the egg has solidified a bit, you should be able to let go. 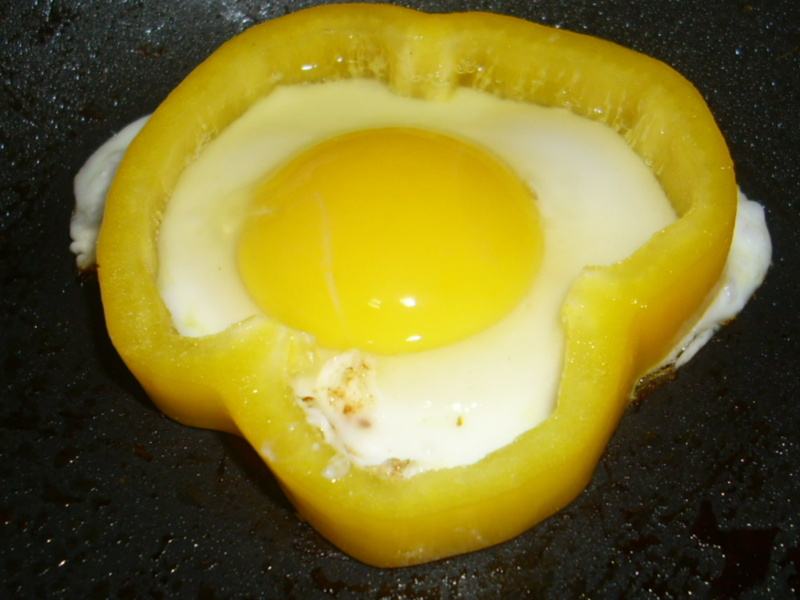 But if you’re worried about aesthetics, simply trim any excess egg from around the outer rim of the pepper ring once the egg has finished cooking. You could also try using a metal cookie cutter like Cutest Food did in the picture below, but I’d recommend having a flat burner to work with. You wouldn’t want to burn your fingers on a hot cookie cutter.